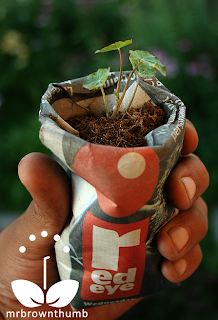 We've all seen those little devices that tidily roll up newspaper into cute little seed starting pots. I had even considered buying one. But over at TipNut, I found a couple awesome blogs that show how to do it yourself at home! This one is from Mr. Brown Thumb! He has a really amazing blog about all kinds of plants, seeds, and all things gardening! The other tutorial I saw was an adorable origami pot from The Three Cheeses. It is almost too cute to plant! Spring is almost upon us....Have you started any seed yet?